The last two days I’ve had problems with Mail.app on OS X 10.10. It started that I was not able to send mails with one account and Mail.app telling me that it was not able to authenticate. I could still receive mails in that account or move mails around, save ‘em in Drafts, but sending never worked. Today my second account started to have the same problem. Looking around on the net I could not find anything useful. I’ve removed the mail accounts in question, renabled them - same problem. Removed the whole account in Systempreferences->Internet accounts, no solution. 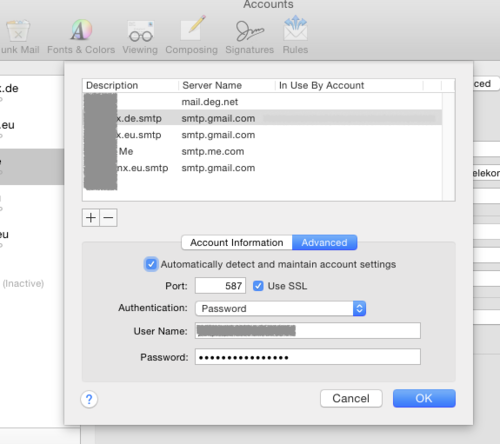 It seems that Mail.app removes it’s SMTP settings when it can not send a mail via SMTP once.